Marketers and business owners who are dedicated to increasing their Return On Investment (ROI) must make a positive impact at industry trade shows. Business swag and fun promotional items are memorable. In fact, 85% of visitors remember the advertiser who handed them a hat or shirt. However, to generate the type of results you’re looking for, consider the latest research. These are 3 cutting-edge trends that Gould discusses. 1. Displays That Engage the Senses. Displays must engage visitors by appealing to all five of our senses. Augmenting the sensory qualities of your display is an ideal method of having individuals connect with your brand. This information demonstrates that it’s wise for marketers at trade shows to discard dull presentations and use distinctive lighting, digital displays that are interactive, video walls, touch-panels, and game mechanics that are integrated into the display. This motivates visitors to interact with and participate in your display. Because the human nose possesses hundreds of more receptors than our eyes and ears do, Gould states that scent should also be a critical element of your display. In order to implement this idea, create a display that will embed and dispense pleasant scents to draw in visitors that are walking by your display. This a factor that has often been neglected in favor of efforts to dazzle visitors. However, walking around a large exhibition hall for the entire day is tiring, and wise business owners and markers who incorporate rest areas with chairs into their booth design will bring in guests who relax in their display area for prolonged time periods. This creates an ideal occasion to present your sales pitch to your visitors. Another business-savvy idea being implemented at display booths is the addition of charging stations along with comfortable chairs for sitting. Visitors in need of charging their various electronic devices flock to these convenient stations, giving you a chance to interact with them. Stations like this will also be more useful to them than business swag. 3. Design Geared Toward Your Business Prospects. A guest’s first impression of your booth is of the utmost importance. In addition to engaging all of the visitors’ senses, it’s imperative to appeal to their imagination and emotions as well. Every aspect of your display must work in conjunction with each other to demonstrate the benefits of your service or product to your prospective buyers. 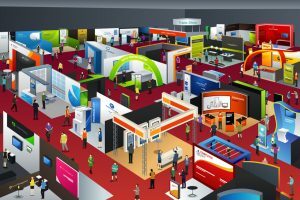 The current display booth trends have moved beyond business swag, and include attention-grabbing, interactive sensory experiences, making prospective customers comfortable, and clearly presenting the ways in which your products and services benefit them. To learn more about how to embrace these “human-centric” trends and increase your ROI, visit a few example exhibit booths and begin utilizing what you’ve discovered.